Love libraries and love coffee? Get the Library Cup! Introducing the Library Cup, a keep cup for hot beverages. The Library Cup is a beautiful 340ml reusable glass coffee cup with a secure push on silicone lid and a wide heat resistant silicone band. YPRL feels it is important to provide an eco-friendly alternative to single use paper cups and encourage our community to be more sustainable. The cup comes in a cardboard gift box. It is dishwasher safe . 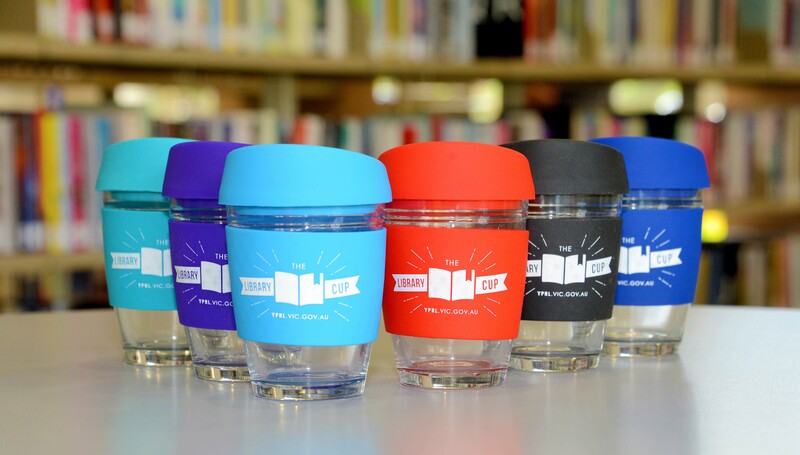 You can buy The Library Cup for $18 inc GST at all YPRL branches. Purchases from Mill Park or Diamond Valley will receive a token that entitles you to a free coffee from the Araluen Café or coffee cart located at the branch. This can be immediately redeemed if the café is open but can be kept for later if it is closed. Would you like your own Library Cup? Head down to your local library today. We love our new Library Cup! We would love to hear your thoughts. Share your feedback below.